A few weeks ago in the middle of a super-busy cake time, I got invited to a friend’s birthday party. With no car and my grocery order already in for that week, I couldn’t easily go get a gift and even though it was specified that gifts weren’t necessary, I really wanted to bring at least a little something. I also had some cocoa butter I bought awhile back with the intention of playing with but haven’t had time, several varieties of pink glittery edible dusts accumulated from various cake show gift bags, raffles, etc. (in this case I used The Sugar Art’s Sterling Pearl Yummy Berry, so thank you to The Sugar Art for donating it to whichever show I got it from! ), some ganache in the freezer (I freeze it in little chunks in a silicone ice tray I’ve had for ages so then I can pull out however much I need), and some nice chocolate in the pantry. So I decided to throw all of that together quickly on the day of the party and make some chocolates shaped like gifts! Step one was to make the ribbon sections of the mould a different colour so they’d stand out. This of course is completely unnecessary, but a nice extra. 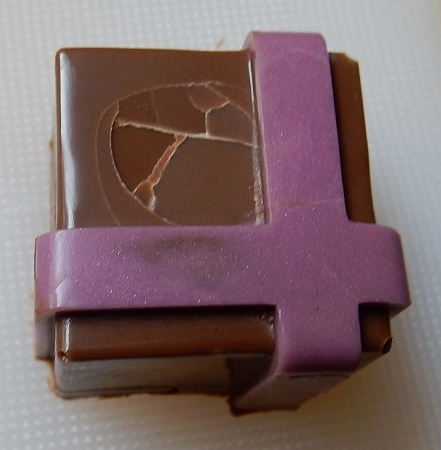 If you were making emergency chocolates with this mould, you could absolutely just make them all one colour. 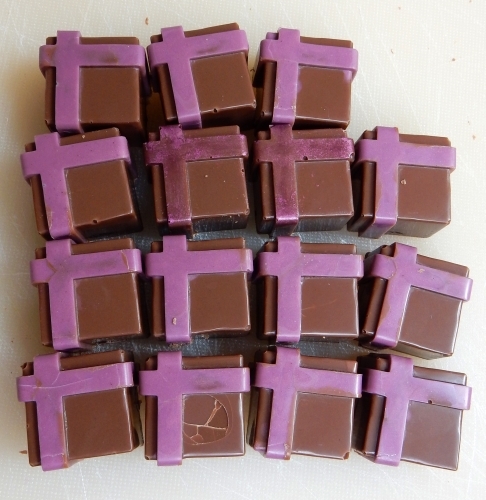 You could also pipe in some different chocolate first (ie some white chocolate if the rest will be dark, or vice versa, or a coloured candy melt). 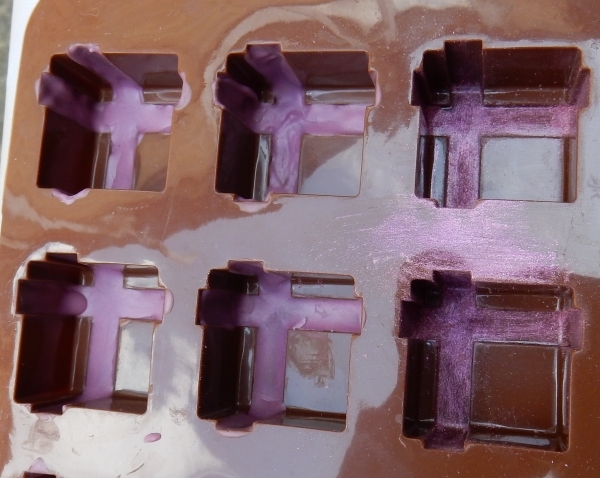 You could even decorate the chocolates after they come out of the mould, but it struck me that I’d get faster, cleaner lines by using the mould itself, so I went with it. Cocoa butter chips in the bowl, glittery pink dust, paint brush, small spatula, and the gift mould. Although I wanted to use the cocoa butter for the most part, I decided it’d also be fun to test what happens if I just painted the dust in directly while still dry, so on two of the mould’s cavities I did that. For the rest, I melted the cocoa butter slowly in the microwave – and I do mean slowly because it was the first time I did it and wow does it ever take a long time compared to full chocolate! But once it was a liquid, I scooped a small amount of the dust in and mixed it up. It made a pearlescent mix which pleased me because I knew it meant the final result would be glittery, which I knew the recipient would enjoy. Then I used the brush to paint the liquid into the lines of the ribbons. I learned quickly that the trick was to start at the top and let the liquid run down and cool as it went, doing this repeatedly to build up layers, because otherwise it all wanted to pool at the bottom and not stick to the super-smooth silicone (which is, of course, half the point of the silicone…to give a glassy-smooth but flexible decorating surface). If too much pooled down, I used the brush to bring it back up the side ribbons until each cavity had a good, thick layer of the tinted cocoa butter. The four on the left have the cocoa butter, and the two on the right have just the plain dust. I found it difficult to get the dust to apply as evenly as the liquid cocoa butter. Further, where the cocoa butter went over the edge, I was able to let it cool and pop it off fairly cleanly, whereas dust that went where I didn’t want it to (which was a lot, on account of it being literally dusty and floating around easily) really stuck on the mould and couldn’t be easily cleaned off without risking the whole piece. Then I did a basic shell-and-fill chocolate. I carefully melted some dark chocolate to just the melting point to keep it in temper (since I’m really horrible at tempering chocolate! ), then poured it in the mould all around, banged it to knock out bubbles, and inverted the mould so excess could drip out. Once that was completely hardened, I warmed up some ganache just enough to be pourable and filled each cavity with a little space left at the top. I popped the mould into the fridge, and about 20 minutes later took it back out. Then I put more melted dark chocolate over the top and gave it a scrape over the top with a larger spatula. I let that firm up again in the fridge for about half an hour to be super sure they were firm, then popped them out. Oops. I learned on the first one not to push on the middle of the gift to pop the chocolate out! Thankfully on the rest I figured out to push from the stronger corners and they all came out cleanly. The two that were dusted directly into the mould are the two in the middle on the second row, and it shows. The dust doesn’t show up as well as it does when it’s embedded in the cocoa butter. I packed them up in a box and took them to the party. 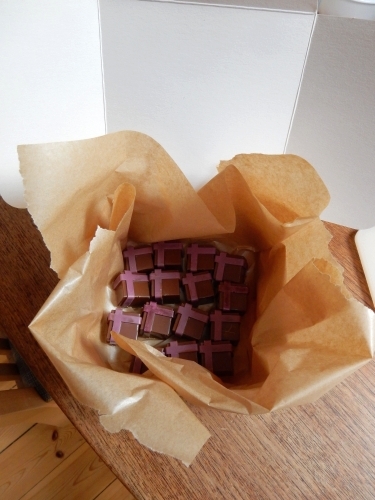 Super fancy packing: plain greaseproof paper in a plain white small cake box. I did tie it shut with some curling ribbon, at least. FANCY DEPANTSI. Having chocolate, frozen ganache chunks, and a gift box mould on hand means I can always whip up a party contribution without having to go shopping. Mixing sparkly, edible dust into cocoa butter and painting it directly into a chocolate mould works better than dusting the mould. Push from the stronger corners of a mould, not the middle! People are really happy when you show up with ganache-filled chocolates. If you’d like to order the same mould, you can do so here (not an affiliate link, but again I did get the mould free from that source for review purposes). I am definitely planning to use some candy melts to make red, white, and green ganache-filled gift chocolates for Christmas this year! 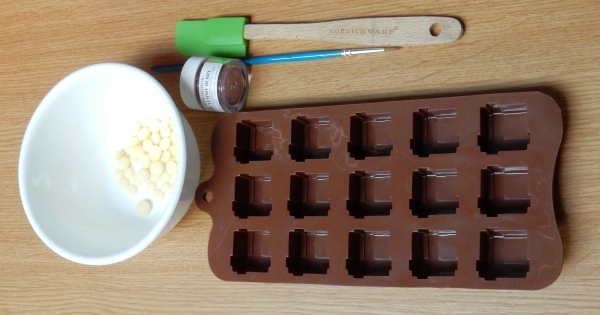 This entry was posted in Chocolate/Candy, Products, Tool Reviews. Bookmark the permalink. Wow, really neat and personal gift.